On October 2, 2014, Jack Porter submitted documentation to the Plan and Zoning Commission to designate the former Downtown YMCA building as a local landmark. City staff recommended denial of the application. The Plan and Zoning Commission voted accordingly. The City staff recommendation was a disappointing demonstration in historic preservation understanding. While claiming to strike a "balance," they built up a straw man conflict between historic preservation and economic development - and then proceeded to demolish it. All without honestly responding to the question at hand: is the Riverfront YMCA building architecturally and historically significant? 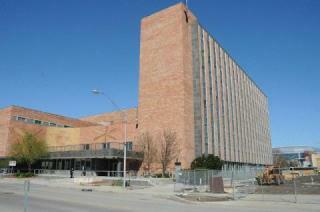 Staff recommends that the “Riverfront YMCA” building at 101 Locust Street not be designated as a local Landmark. Downtown YMCA Building: Designed by William Wagner of the noted Des Moines architectural firm Wetherell & Harrison, the YMCA (1957-60) is one of the city’s largest and most important examples of International Style architecture. The building is composed of an eight-story residential tower facing the Des Moines River and a lower section containing community rooms, auditorium, natatorium and other public facilities.Sure, why is that? While the building may be eligible for designation, staff believes that the site is the most important feature in light of numerous plans and implementation activities. Translation: "We've had conversations with people who have lots of money and want a vacant piece of riverfront property. So, even though the building meets the requirements for historical and architectural significance, we're going to go ahead and go with the money." The overall interest of the City is to insure that development of the site is maximized from an economic and aesthetic standpoint regardless of whether the building is saved or demolished. Translation: "We don't really know yet what will go in place of the historic building, and honestly don't really care, but we'll just keep going with the money for now. You've heard the saying, 'A bird in the hand is worth two in the bush,' right?"